In Broward County, Florida, survivors of the shooting at Marjory Stoneman Douglas High School have launched an unprecedented youth-led movement to demand gun control. At a rally on Saturday, survivors demanded politicians stop accepting money from the National Rifle Association. In Florida, as funerals continue for the 17 people killed in at the Stoneman Douglas High School in Broward County, Florida, survivors of the school shooting have launched an unprecedented youth-led movement to demand gun control. 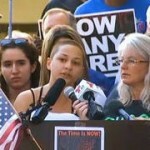 At a rally on Saturday, survivors of the school shooting demanded politicians stop accepting money from the National Rifle Association. Here’s the full speech of Emma Gonzalez, a senior at Marjory Stoneman Douglas High School. As this week marks five months since Hurricane Maria battered the island of Puerto Rico, more than a quarter of the island remains without power, marking the longest blackout in U.S. history. While the official death toll is just 64, it is believed that more than 1,000 died since the storm struck the island on September 20. Puerto Rico’s governor has also announced plans to privatize the Puerto Rico Electric Power Authority, known as PREPA, which is the largest publicly owned power authority in the United States. Five months after Hurricane Maria hit Puerto Rico, swaths of the island still have no electricity, while food and water supplies have been slow to arrive. The Federal Emergency Management Agency, known as FEMA, has been hit by a series of scandals, after it was revealed that only a fraction of the 30 million meals slated to be sent to the island after Hurricane Maria was actually delivered. FEMA approved a $156 million contract for a one-woman company to deliver the 30 million meals. But in the end, FEMA canceled the contract after she delivered only 50,000 meals, in what FEMA called a logistical nightmare. This came after FEMA gave more than $30 million in contracts to a newly created Florida company which failed to deliver a single tarp to Puerto Rico. It needed to be said, Emma Gonzalez. America doesn’t care about its kids – black, white or Puerto Rican. The only thing that matters is money. Capitalism has gone mad and your life is worth no more than the profit made on the bullet that ends it. Here’s a track I should have known years ago but have only just discovered. Keep the faith, peoples!